Adi Kailash Trek (Haldwani - Nainital - Almora - Patal Bhubhneshwar Cave - Bering (Chaukori)- Didihat - Dharchula - Narayan Ashram - Gunji - Nabhidhang - Kalapani - Jolingkong - Kutti - Gala - Sirkha - Dharchula - Pithoragarh - Bhimtal - Haldwani). Mt. Adi Kailash is popularly known as Chhota-Kailash. It is located in Indian territory, very close to the Indo-Tibet border. This region is a place of great natural beauty, serenity and sovereignty. Those tired of the incessant roar of urban life, will find this place to be a spiritually healing quietude. At the very foot of Chotta Kailash is Gauri kund reflecting its entire expanse. Yet another water body close by is called Parvati Sarovar. Also known as 'Mansarovar' it is much smaller than the original one. A temple dedicated to Shiva and Parvati is there at the shoreline. Following the Chinese occupation of Tibet Chotta Kailash served as the most revered substitute of Mount kailash. The locals living in Adi Kailash are known as Bhotias. The Bhotias have preserved their ancestral heritage throughout all these years and are always ready to showcase glimpses of their tradition through dance and music shows. You will simply love interacting with these people and hear interesting stories of their land. From Gunji the kailash Mansarover route branches off to Kalapani from where the Kali river originates. Onwards from here is Navidhang (3987m) Lipupass is only 9kms from here. From Navidhang "Aum Parvat" ,the miracle of nature is clearly perceptible. Snow lies on this mountain in the shape of a perpetual "Aum", the primordial sound. All other slopes may be bare but this inscription in snow is everlasting and as one observes it, one gets the feeling that the mountain itself is Lord Shiva incarnate. No hypothesis, no assumption and no imagination are ever required to visualize this "Aum" sprawled on the mountain slope since time immemorial. Passing through the beautiful valleys of Beans, Chaundas and Darma one encounters in this region different and ever changing moods of snow covered mountains, beautiful rivers, towering peaks and tradition villages like Gala, Garbiyang, Budhi, Gunji, Napalchu Navi, Rongcong and Kutti inhabited by the Rang tribals of Shauka origin. It indeed is an exciting trekking region. Not only does one walk here along a large portion of the- Kailash Mansarovar route, one often feels this physical experience transpiring into a spiritual experience of lasting consequences. Adi-Kailash yatra is able to transfer your physical journey into a spiritual experience, a journey in search of truth. Arrive at Haldwani / Kathgodam by overnight train / bus. We pick you from Railway Station or Roadways Bus Station. Assembling at Kathgodam Railway Station. At 9 AM we proceed to Berinag. Enroute visit Patal Bhubhneshwar Cave (described in Skand Puran, and as per Hindu Mythology Legend and folklore have it that this underground cave enshrines Lord Shiva and thirty three crore Gods. It is also believed that this cave is internally connected to the four abodes /seats (Char Dham). Overnight stay in Hotel at Berinag (known for Tea Gardens and enchanting view of Panchachuli Himalayas). After breakfast we drive to Dharchula. Enroute visit Swami Narayan Ashram at Narayan Nagar (The Ashram was establishd by a hermit and a social worker Narayan Swami ji. The ashram survives through donations from various institutions and individuals). Overnight stay in Hotel at Dharchula, here the tourists are briefed about the Chiplakedar trek. Early morning medical checkup of all the tourists. After breakfast we drive to Tawaghat (19 km. ), after a warm traditional welcome drive to Narayan Ashram, and then trek to Sirkha. Camp here overnight. In evening we organize local folk dance (Chanchari dance) by localaites followed by a local tribal delicacies dinner. In the morning 2 kms trek down Samuri. From here a steep stony climb through thick forest to Sumariya - Dhar (3048 mts/9998 ft). On the top there are so many stone boulders with flags. From here you will enter in a thick forest to the stream Simkhola - gad. After few minute you will enter at Galla village and Jipti. Again you can see Kali river which is missing from Tawaghat. Reach Galad by evening. Dinner and overnight stay at Galagad in tents. In the morning after breakfast trek to Malpa. Today the trek is difficult up to Garbyang. There is a steep down up to the Kali River. After few hrs treks we will find a beautiful Najang waterfall. It's almost 100 feet high. After a zigzag trek we will reach Malpa. Dinner and overnight stay in tents. In the morning after breakfast set out for another challenging trek. 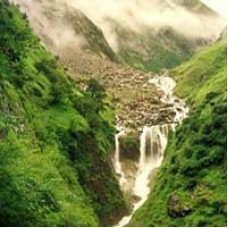 You will find lush green valley, murmurings waterfalls falling like shower. In last couple of hrs we will trek a steep ascent till Budhi Village. Dinner and overnight stay in tents. In the morning after breakfast start your trek with a steep climb to Chhiyalekh. Today we will also trek through lush green valley and with a numerous of wild flower. Today you can see also a glimpse of Mt. Annapurna and other Himalayan peaks. The trek is full of thrill with its beauty. Arrival at Gungi by evening. Dinner and overnight in tents. In the morning trek up to Kutti follow to Kutti River. Her you will find high altitude forest of Bhojpatra (Betula Utilies). Her you can see a magnificent view of the Api and Nampha peaks. Kutti is the last village on this trek. Bhotia (local tribe) is local people who lived here. Kutti is named after Kunti (Mother of the Pandavas) in the epic Mahabharata. The local people tell you the truth about the Kutti village. Dinner and overnight stay in tents at Kutti. In the morning start your trek to reach Jollingkong. It's the last stretch of the trek to reach the base of Holy Mt Adi Kailash (6191 mts/20307 ft). Arrive Jollingkong by evening. Here is a check post of ITBP (Indo-Tibet Border Police). Dinner and overnight in tent/Fiber Huts in Jollingkong. In the morning trek to Mt. Adi Kailash. One can see Parvati Lake also. After spending a couple of hrs trace back your feet to Jollingkong. Dinner and overnight stay in tents/Fiber Huts in Jollingkong. In the morning track back to Kutti. Dinner and overnight stay in tents. Morning after breakfast trek to Budhi. Dinner and overnight stay in tents. After breakfast we trek to Narayan Ashram (another one from mentioned above in Day 2 Itinerary), and then drive to Dharchula for overnight stay. Enroute we visits Chirkila (A famous Dam constructed on river Dhauliganga, producing 280 M.Watt. of electricity), Pangu Village (A Famous village Bhotiya Tribe of India), Narayan Ashram (established in year 1925 by Narayan Swami ji, a very ideal place for self meditation, to achieve self-realization in terms of boby, mind, and soul). Overnight stay in Hotel at Dharchula.